← Fifty Shades of Fundamentalism: What is Fundamentalism and where did it come from? 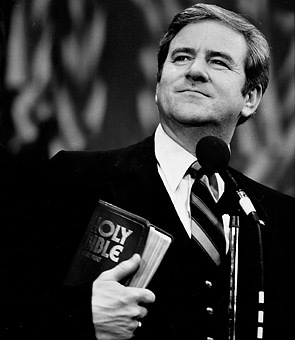 Jerry Falwell: A more contemporary Christian Fundamentalist. The main problem with Fundamentalist Christianity is that it disguises its vices as virtues, and those within it truly believe their worst weaknesses are their greatest strengths. But what do I mean by this? To explain what I mean I need to step back a bit to the bigger picture and talk about worldview. Every human has a web or system of beliefs that they have inherited from our surrounding culture. This collection of beliefs has been formed and reinforced by countless interactions with those around us. For the most part these beliefs are unexamined and poorly understood. We make use of these webs of belief intuitively all the time in our lives, and they are taken for granted and an assumed part of life. These beliefs are used to interpret all of our life experiences from the mundane and seemingly inconsequential to the sacred and larger force that drive our lives. These webs of beliefs dictate how we experience life, what we see as an appropriate response to situations and people and enable us to have meaningful social interaction. These webs or systems of beliefs have been labeled in a variety of ways and are closely related to culture, religion, and other aspects of our existence but perhaps “worldview” is the simplest and most accurate term as this sum total of beliefs shapes how we view this world and our existence. Regardless of how we label these systems of beliefs, we all have them. There are countless different worldviews and no single worldview apparently can adequately explain all of life’s myriad of experiences. Often, the first time a person becomes aware of a belief within their worldview is when that belief breaks down. We are exposed to new information or experiences that do not fit our web of beliefs, we run into things that we cannot explain with our current web of beliefs. These experiences go against what should happen according to our beliefs and this causes us distress. In these times we are unsure of ourselves and how to response, we can become suspicious of other parts of the web of beliefs (because if this one belief was wrong, which other ones are wrong? ), and ultimately we do not feel in control. The process of assimilating new information into our worldview or accommodating new information by changing or modifying our beliefs makes us all uncomfortable. Humans naturally avoid changes to our worldview if at all possible and take the smallest change possible when we are forced to by specific circumstance and experiences. Now, no one likes to have their worldview questioned or challenged. This is human nature. However, some take the desire to keep their worldview the same to the extremes. Occasionally when faced with data, facts, sound arguments, and experiences that contradict their worldview, some people will, instead of changing their worldview, instead knowingly ignore or refuse to acknowledge discordant information completely. They refuse to engage with alternative beliefs and instead redouble their efforts to hold fast to their current beliefs. This might be done with one particular belief, a whole system of belief, or somewhere in between. This might be done temporarily, such as until the evidence becomes overwhelming, or this might be done permanently as the person writes off the conflicting experience or viewpoint permanently. This is known as taking the stance of unassailable ignorance; one’s beliefs are unassailable because one is willfully choosing ignorance. One’s worldview is protected because you are not considering alternatives that might explain discordant information that your worldview cannot. This is done to prevent ever having to change one’s worldview. Though it is an immature and fearful tactic, it is employed far too often. With that in hand let us turn back to Fundamentalism. Practically speaking, Fundamentalists believe they have arrived at absolute truth regarding faith and the Bible. By itself, this is incredibly arrogant stance and it discounts centuries of competing and changing interpretations and applications of scripture within Christian history. Does one really think that after 2,000 some years, a number of American Christians finally figured it all out? In Fundamentalist culture, this notion of cultural infallibility extends far beyond the Five Points of Fundamentalism or the other aspects of Fundamentalism that I have mentioned. The belief that Fundamentalists have it all figured out extends to a whole system of beliefs that includes the Fundamentalist approach to politics, sociology, gender relations, race relations, humanity’s relationship to the land, culture, etc. Now far from being absolute “biblical truth,” many of these beliefs are either plainly wrong or debatable when judged by scientific, theological or biblical standards. I personally disagree with the vast majority of what Fundamentalism teaches and I actually see much of what they suggest to be “biblical truth” to be the antithetical to the Gospel of Jesus Christ and the actual biblical narrative, as well as lots and lots of science. …that continue to go unacknowledged. From the outside, these errors are plainly obvious and the whole Fundamentalist project looks as stable as a house of cards. How can these errors go unchecked? How can this level of theological arrogance not cause people to question, even within the community? How does the whole Fundamentalist project keep going on decade after decade? What makes Fundamentalism so problematic, what enables it to persist despite its many errors, is that within the Fundamentalist worldview unassailable ignorance is re-defined and celebrated as faith. This thinly veiled unassailable ignorance is actually actively encouraged and those within the Fundamentalist worldview are categorically prevented from recognizing their error and the immaturity and absurdity of this pervasive practice within Fundamentalist culture because it is internal justified. But let me break that down a little bit. To persist in their beliefs without changing Fundamentalists have had to, as a culture, pervasively adopt a stance of unassailable ignorance. Fundamentalists disregard all other positions about faith, life, God and the Bible categorically. They refuse to engage in discussion and refuse to consider alternative viewpoints. This blatant and wholesale adoption of unassailable ignorance would appear to be highly problematic to anyone, and I think many Fundamentalists would recognize it themselves and call for change but for some unique twists within the Fundamentalist worldview. You see, some of the central beliefs and attitudes of Fundamentalism is the notion that they are under attack and “the Enemy” is out to corrupt their faith and their grasp of the truth. This necessitates a defensive, fearful and hostile posture to anything that is not part of the Fundamentalist worldview. Within the Fundamentalist mindset, to entertain alternative beliefs is to consider and entertain heresy that strays from biblical truth. Engaging with these other positions can only corrupt the “biblical truth” Fundamentalists already heave and is unnecessary because Fundamentalists already have it figured out. Therefore, the default prescribed reaction to information, people and experiences that contradict the Fundamentalist worldview is to treat them not just with suspicion but active aversion and attack. This leads to an incredibly problematic situation where Fundamentalists choose to make uneducated and uninformed judgments (because they refuse to engage with and learn about alternative viewpoints) about everyone and every position that is not part of Fundamentalism’s worldview (because they believe they have arrived at all truth and everything else is false teaching) lest the Fundamentalist Christian be led astray (because “the Enemy” is out there trying to de-Christianize them). Christian Fundamentalism, like all expressions and understanding of Christianity, has errors and insights. What makes it problematic is that its errors are allowed to persist and it remains perpetually immature and in error. This situation would be seen for what it is, the use of unassailable ignorance rooted in fear, but within the Fundamentalist worldview these behaviors are actually understood to be faith. Vice is misunderstood as virtue. This entire worldview is then perpetually protected from change (for better or for worse) and this allows the errors to persist and indeed be seen as aspects of true Christian faith and biblical truth, even though they are not. This entry was posted in Christianity and tagged American Christianity, Christian Fundamentalism, Christianity, Fundamentalism, religious fundamentalism, Why is Christian Fundamentalism bad?. Bookmark the permalink.